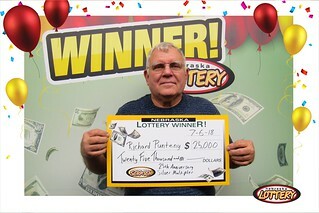 Richard Punteney of Omaha won $25,000 playing the 25th Anniversary Silver Multiplier Scratch ticket from the Nebraska Lottery. Punteney bought his winning ticket at Bucky’s #38 at 13736 Q St. in Omaha after winning a few extra bucks playing the same game. Punteney said he nealy jumped up and down when he discovered what he won. Punteney said he’d use his winnings to pay off some bill and said he’ll probably split the $25,000 with his wife. As a $20 Scratch game, 25th Anniversary Silver Multiplier offers players a chance to win prizes from $20 to $25,000. The chances of winning $25,000 are one in 21,000, while the odds of winning any prize are one in 2.76.